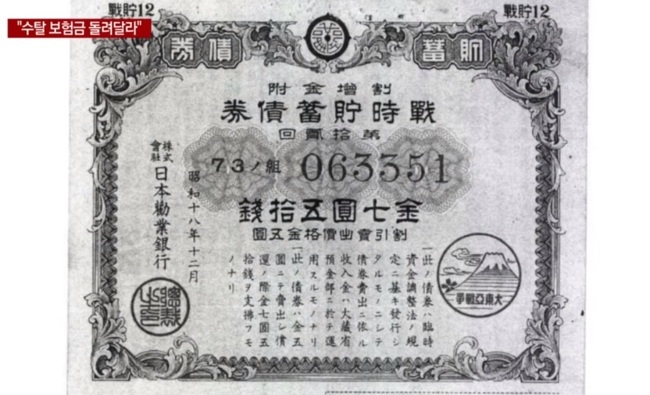 A South Korean man has reportedly filed a damage suit seeking compensation for war bonds and insurance products his father was forced to purchase from Japanese financial companies in 1943 during the Japanese colonial rule of Korea. According to a report by local broadcaster YTN on Thursday, Ahn Chul-woo, an 80-year-old man living in Busan, is pursuing a lawsuit in Korea against Japan Post Group, a major financial company and postal service operator in the neighboring country. Ahn directed his suit against Japan Post on the grounds that the entity was formed by merging Japanese financial firms that were present at the time of Japan’s occupation of Korea, and therefore, it is the party responsible for bonds and insurance products sold during the period. War bonds are debt securities issued by a government for the purpose of financing military operations and other expenditures during times of war, such as the Pacific War in which Japan fought against the Allied Nations between 1941 and 1945. Producing proof of war bonds and insurance contracts as evidence to the local court, Ahn has sought compensation for the bonds at present monetary value, arguing that considering the forced nature and the amount of fundraising, the payback period should be exempted from expiration. The case has been tried twice. The court sided with the Japanese firm and accepted the view that even if the bond and insurance deal purchases were legitimate, the mandated payback period has expired. The court has also said that there is a lack of evidence to suggest that the postal unit of the Japanese Government General of Korea is equivalent to the present-day Japan Post. The lawsuit will be heard in the Supreme Court of Korea, the country’s highest court, for a final ruling. Meanwhile, Chung Chae-won, a 103-year-old man who worked at a railway company during the Japanese colonial rule, has reportedly provided additional testimony that the Japanese government would punish or refuse to hire Koreans for job positions at the time unless they signed up for an insurance deal.